St. Patrick’s Day is right around the corner—a day full of parades, celebration, Irish heritage, and all things green. This year, we decided to spruce up our St. Patty’s Day menu. Using the traditional ingredients and Paula’s recipes, we came up with a fantastic menu that is a twist on the traditional. Your guests will be sure to love it! The meat is the focal point of this delicious meal. Traditionally it’s corned beef, a cured and salted cut of beef that is braised over a long period of time, but this year we decided to substitute this dish with Marilyn’s Slow Cooker Pot Roast. Braised for hours in a slow cooker, this pot roast is delicious, tender, and juicy. And, now for the sides: No St. Patrick’s Day dinner is complete without cabbage. Paula’s Country Style Fried Cabbage is the perfect substitution for the blander boiled variety we are used to. Cooking the cabbage in bacon fat takes the flavor to a whole new level! We all know the Irish love their potatoes, but who wants plain old boiled potatoes when you can have Buttery Buttermilk Mashed Potatoes? This dish is irresistibly creamy with an added richness from the buttermilk. To add a little color to your plate, we thought we would mix in a bright veggie. Paula’s Honey Lemon Carrots are sweet, tangy, and the perfect pairing to the rest of your meal. You’ll definitely need something to sop up all the yumminess from your plate. Skip the Irish Soda Bread this year, and make a batch of Paula’s Garlic Cheese Biscuits. Flaky and cheesy, biscuits don’t get any better than this! So now that you have the basic meal down, it’s time for dessert. You know Paula—she loves her grits. She loves them so much she even puts them in dessert. 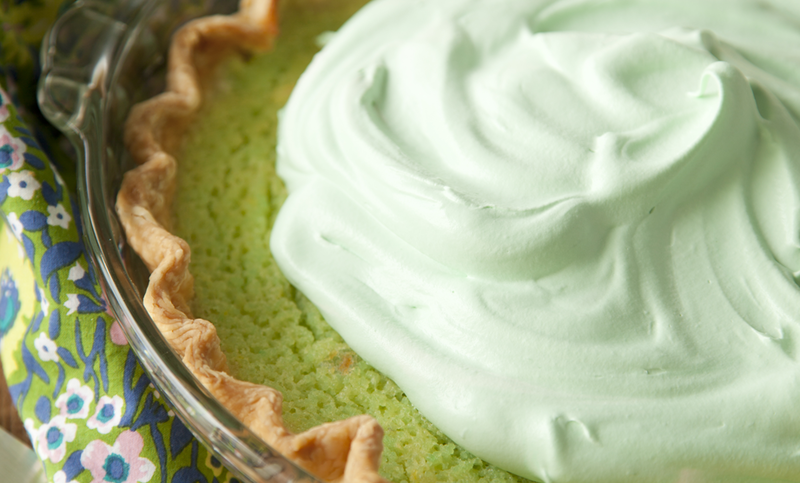 Her Green Grits Pie is the absolute perfect dessert for St. Patrick’s Day. Sweet, creamy, and bright green, it’s an absolute must-have for your party! Really impress everyone, and make a batch of Homemade Irish Creme Liqueur to wash it all down with. This St. Patrick’s Day, have fun, celebrate to your hearts content, and fill your belly with Paula’s not-so-traditional feast!